Roald Dahl’s classic Matilda comes to life on Sydney’s Lyric Theatre after playing on Broadway and the West End, with music and lyrics by Australian musical comedian Tim Minchin. From walking into the theatre and seeing the decadent stage, lined with giant tiled letters and bookcases, is an engaging and original set designs, putting the audience into a fun and over the top frame of mind. What follows is one of Dahl’s most popular stories: Matilda Wormwood, a true child genius, begins elementary school under the care of the horrible Miss Trunchbull, who rejects the importance of books in favour of physical education. All the while Matilda’s teacher Ms. Honey builds a connection to Matilda, and appreciates her and respects her more than her own parents and older brother. Minchin’s music and lyrics compliments Dennis Kelly’s book phenomenally, with each sing reflecting a different aspect of the human experience and fanatical stories of the original book. “Naughty” is a fun but meaningful song about empowerment in the face of harsh odds, while “School Song” is potentially one of the most unique musical numbers of a show in recent years, with it’s fantastic set-up and choreography adding to the charm. There are outlandishly hysterical songs about hammer throwing and overly-sentimental sorrow in the story of Ms. Honey’s past, but it’s “When I Grow Up” that stood out the most – a meaningful song about the innocence and dreams all children once had that hits a nerve and leaves the biggest impression on the audience. Lots of the singing, acting and dancing is reliant on the fantastic young cast. As they are rotating roles, it’s unlikely you’ll see the same character twice, but that doesn’t mean the standard still isn’t incredibly high. Ten-year-old Georgia Taplin was exceptional as Matilda and got the comic timing perfect throughout the show. And its certain that Molly Barwick, Sasha Rose and Bella Thomas will all be as excellent as the last in their portrayals. In the adult cast, Elise McCann shines as Ms. Honey, as does Marika Aubrey as Mrs Wormwood, but its James Millar’s spot on performance as Miss Trunchbull – a character that will last the ages – that had the best laughs and deserves the next Australian theatre award. 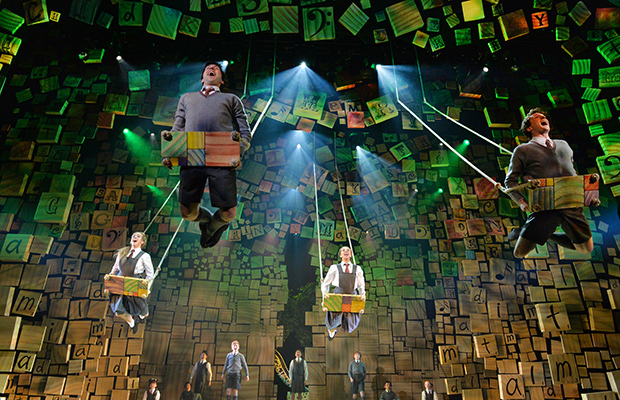 The best thing about Matilda is its innovation. The performers go above and beyond the performers of regular stage shows, the dance moves are electric, the songs are refreshingly original, the set design is loud, and the energy of the performance is contagious. How the show plays with words and stories is fun and charming, still retaining the magic of the original source material. The comedy and witty lines and songs are all executed with precision and you can feel Minchin’s liveliness throughout the whole show. It’s Les Miserables for children, with its strong themes about being liberated from the people in power and those who control your life. But more than that, Matilda is an original piece of live performance that uplifts spirits and leaves you walking out of the theatre singing along and wishing you were a child again.